Illustration courtesy of Wheeler Engineering. 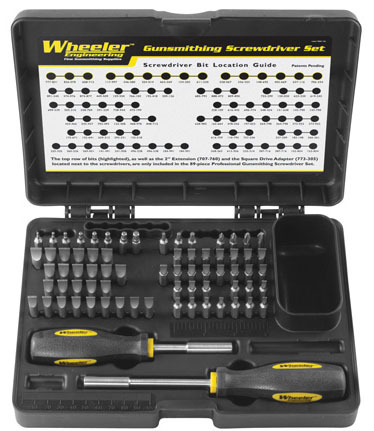 This Wheeler screwdriver set is called a "Professional Gunsmith" set. We have to take issue with that, as it is not only for professionals. It is our opinion that virtually all shooters and firearms owners, not just gunsmiths, should have this set on their bench. We have more firearms in our collection than we care to mention here. Suffice it to say that over the past fifty years, "standardized" screws don't seem to exist between gun manufacturers. When you tear up the head of what should be a five cent screw and it costs $0.99 or more to replace (if you can even find one), or scratch the receiver of a valuable firearm, the Wheeler set becomes not only a bargain, but a "must have". As shooters, we spend hundreds and thousands of dollars on our firearms and scopes, but commonly go cheap on the screwdrivers necessary for their maintenance. We made do for years with a $25 generic "gunsmith kit" that we got on sale at a hardware store, but in the repair, take-down and maintenance of our firearms, there were always screws that the bits didn't quite fit. As such, we are guilty of inflicting unnecessary damage on screw heads and occasionally the surrounding metal. Finally, my bride had enough after I scratched the finish on her favorite rifle. (I' haven't lived that one down yet.) She began an Internet search for a true professional gunsmith screwdriver set. When she saw the Wheeler 72 piece set at the 2013 SHOT Show in Las Vegas, she ordered it and presented it to me last month. Upon opening the case, I felt like "Tim the Toolman." What a cool set! It came with two handles, one for general work and a smaller one for close quarters, and more bits than I would have ever thought necessary. I checked out the Wheeler website and found that in developing this set, their engineers measured more than a hundred screws from modern and antique firearms to insure that they had a bit to fit just about every screw used in any gun. Antique firearms? I had to put that to the test, so I dragged our 1861 Colt Navy out of the safe and began to disassemble it. To my amazement (and relief), there was a bit that precisely fit every screw in that old pistol. How about modern firearms? We took a Winchester, Ruger, Remington and a couple of Savages from the safe and began in earnest to strip them down for a thorough cleaning. Not once did we encounter a screw of any size or design that we didn't have a bit for. Because the Wheeler bits are hardened to 56-58 Rockwell C, there was no problem removing even the tightest screw without stripping the head or damaging the bit. The Basic kit comes with 54 Hollow-ground flat bits range in size from .120"x.020" to .360"x.070" and 15 Phillips, Allen and Torx bits to cover scope rings, bases and recoil pads. The shank of each bit is etched with its size and there is an index for all bits on the inside cover of the storage case. Since it is possible to break the smallest bits (any gunsmith will confirm this can happen with stubborn screws), Wheeler included two each of the two smallest flat bits (387-716 and 152-854). Just in case a few readers aren't familiar with the difference between "gunsmith" flat tips and the standard flat tips that you get in your hardware store, gunsmith screwdriver tips are hollow ground. The sides of the blade are parallel at the tip. A typical hardware store screwdriver blade is tapered all the way to the flat end of its tip, with the result that it will not bottom out in a gun screw slot, which always has parallel sides. This is why standard screwdrivers so often slip out of gun screws. I would like to see Wheeler include the handle extensions in the basic kit (they are included in the expanded Professional set, along with 15 additional bits). Most of us won't need the extra bits, but the extensions would be nice to have. The 2013 MSRP of $69.99 may seem a lot to some folks. However, given the benefits to our expensive guns, it is a bargain price. My bride did good. I'm keeping her and the Wheeler screwdriver set.